Hikoshima. Laid down by Mitsubishi Zosen K.K. shipyard as a 361-tons trawler (FV) for Kyodo Gyogyo K.K. Launched and named SAPPORO MARU. Kyodo Gyogyo K.K receives a steamer trawl fishing permit available for 10 years. Operation areas include: (A) Tokai and Yellow Sea, (B) Bering Sea E of 160E, within the line from Cape Olutluski to Cape Nawalin excluding sea level within 60 depths of water, (C) South China Sea. Harvesting ports are: Tobata, Shimonoseki, Nagasaki, Osaka, Aomori and Hakodate. Operations in Tokai and Yellow Sea are forbidden. Harvesting ports are changed to: Tobata, Shimonoseki, Nagasaki, Osaka, Aomori, Hakodate and Hong Kong. Her owners are restyled to Hiroshi Gyogyo K.K. Her owners are restyled back to Kyodo Gyogyo K.K. Kyodo Gyogyo K.K steamer trawl fishing permit is renewed. Operation areas include: (A) Tokai and Yellow Sea, (B) South China Sea. Harvesting ports are: Tobata, Shimonoseki, Nagasaki, Osaka and Hakodate. Nippon Suisan K.K. receives a steamer trawl permit. Operation areas include: (A) Tokai and Yellow Sea, (B) South China Sea, (C) Offshore Mexican coastal areas including California Gulf, Central America offshore coast from Guatemala to Cape Mariato, Panama, (D) West of 80W in Mexico Gulf and the Caribbean Sea. Harvesting ports are: Tobata, Shimonoseki, Nagasaki, Osaka, Hong Kong, Los Angeles, Balboa, Cristobal, Manzanillo, Galveston, New Orleans, Masarang, Bellacruise, Tampico and the Mexican Government’s Authorized Ports of Islands. Ownership is changed to Nippon Suisan K.K. Arrives at Humen, Pearl River estuary, China. 0915 ~ 1140 comes alongside to starboard of auxiliary gunboat DELHI MARU and replenishes her with fresh food. 1400 ~ 1500 comes alongside to starboard of auxiliary gunboat DELHI MARU and replenishes her with fresh food. Arrives at Ling-Ting (Lintin) Island (now Nei Lingding Dao), Pearl River estuary, China. 1652 ~ 1816 comes alongside to starboard of auxiliary gunboat DELHI MARU and replenishes her with fresh food. Departs Ling-Ting Island later that day. Departs Tateyama in an unnumbered northbound convoy also consisting of IJN auxiliary transport SHINSEI MARU No. 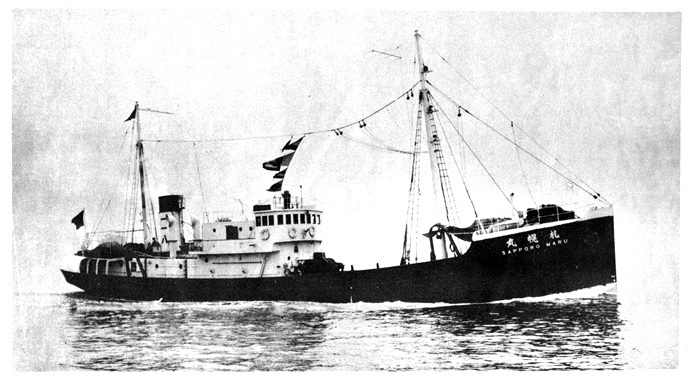 18, IJA transports AMAHO, FUKOKU and NICHIUN MARUs and IJN requisitioned (B-APK) HEIWA MARU, escorted by survey ship KOMAHASHI and minelayer UKISHIMA. Late that day when 55 degrees off Katsuura, KOMAHASHI is detached and returns to Yokosuka. Ownership is changed Nihon Kaiyo Gyogyo Tosei K.K. SW Truk, north of Fefan Island, Truk Lagoon. Sunk by USN TF-58 aircraft at 07-18N, 151-21E. Two crewmen are KIA. There were two categories of Kyuryosen. (Ko) category with an IJN Captain as supervisor aboard and (Otsu) category without.